1 Scrub potatoes and cook in a large saucepan of boiling water until tender (35-40 minutes). Drain in a colander and set aside to cool slightly and steam until cool enough to handle (5-10 minutes). 2 Peel potatoes (discard skin). 3 Press flesh through a potato ricer onto a work surface lightly dusted with flour. 4 Add three-quarters of flour, a pinch of nutmeg and a large pinch of fine sea salt. 5 Lightly knead until dough just comes together and is smooth (add a little more flour if necessary). Take care not to overwork the dough. 6 Form a 3cm piece of dough into a gnoccho and cook in simmering salted water until gnoccho floats (1-2 minutes). Taste and ensure the mixture isn’t too floury (cook 30 seconds longer if so). If gnoccho disintegrates, add more flour to mixture, but do not overwork. 7 Divide dough into four and roll one piece at a time on a lightly floured surface to a 1½cm-thick cylinder. Cut into 2cm pieces. 8 If making ridged gnocchi, shape with a fork. Place on a lightly floured tray and repeat with remaining dough. Cook gnocchi in batches in simmering water until they float (1-2 minutes). Drain, transfer to a warm serving dish, season to taste and set aside. 9 Preheat oven to 200 degrees, add salt pepper and olive oil to pumpkin and roast for 15 minutes or until tender and set aside. 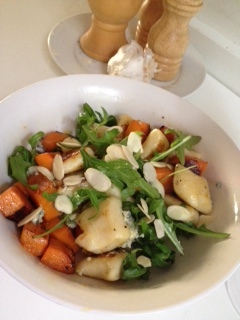 10 Divide gnocchi in bowls, add pumpkin, crumbled blue cheese and rocket. Drizzle with olive oil and add almonds.